Our observable universe has 68.3% dark energy, 26.8% dark matter and 4.9% ordinary matter. 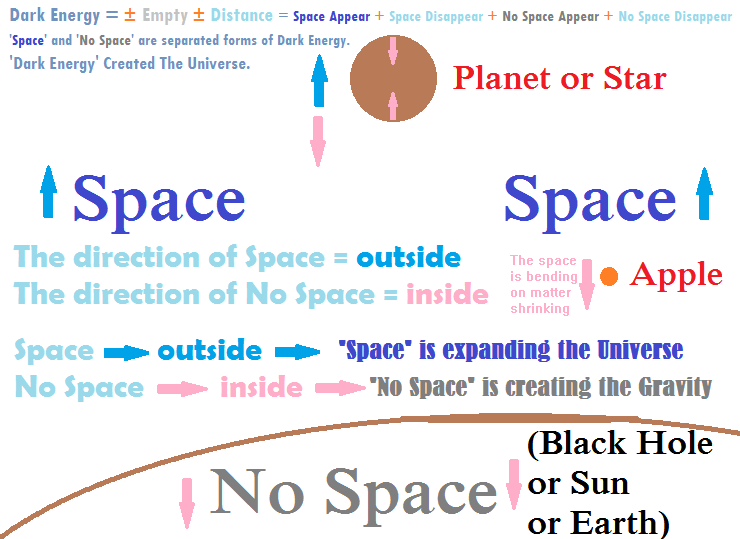 Direction of the Space = Outside = It is expanding the Universe = Appearing until it starts disappearing again, but the Dark Energy can control it. 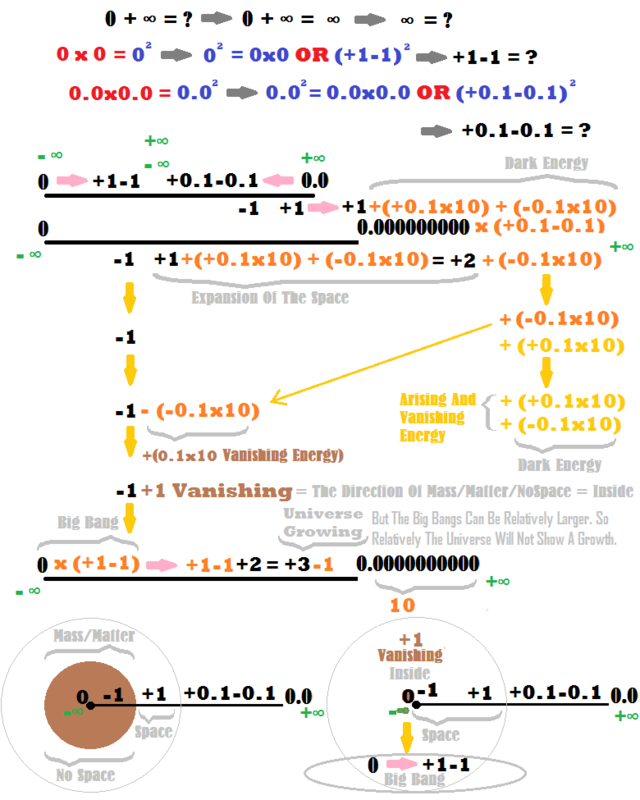 Direction of the Black Holes/Matter/Form/Stars/Planets = Inside = It is creating the Gravity = Disappearing until it starts appearing again, but the Dark Energy can control it. Everything is connected. The quantum physics already proved it (‘Spooky action’ builds a wormhole between ‘entangled’ particles). So the everything we write on the space by changing the form of the appearing and disappearing quantum fabric of the space are connected to us, and it can impact our lives on the movements and the energy of the starts and planets with the interaction between our solar system and the fabric of the space where our details are recorded. ග්‍රහලෝක සහ සූර්යයා එකම තැනක රැඳෙන්නේ නැතුව සුළියක් (vortex) ආකාරයට ඉදිරියට ගමන් කරන නිසා අධික වශයෙන් නාමයන් (දත්ත/data) එකම තැන නැවත නැවතත් සටහන් වීමක් සිදුවෙන්නෙ නැති නිසා අවකාශය තුල තරමක් පැහැදිළිව තොරතුරු සටහන් වීමක් සිදුවිය හැකි බවත් හිතන්න පුළුවන් (our solar system is a vortex). මං හිතන්නෙ හිස් අවකාෂය සම්පුර්ණයෙන්ම හිස් නැහැ කියලයි. රසායනිකව ප්‍රතික්‍රිය නොකරන සහ ගුරුත්වාකර්ෂණට හසු නොවන විදියට ඇති වෙමින් සහ නැතිවෙමින් පවතින අංශු පිරිච්ච අවකාශයක් තුල අපි පනුවො වගේ හාරගෙන යමින් සටහන් තබනවා කියලයි මං හිතන්නෙ. ඒ සටහන් තබන මාර්ගය හරහා ග්‍රහලෝක ගමන් කරන නිසා අපේ කර්මයන් වලට බලපෑම් කිරීමට හෝ අවහිර කිරීමට හැකියාවක් ග්‍රහලෝක සහ තරු වලටත් හිමි වන නිසා තමයි තරු සහ ග්‍රහලෝක වල පිහිටීම අපේ ජීවිත වලටත් අසාමාන්‍ය විදියට බලපානවා කියල කියන්නෙ. අපි ඉපදෙන වෙලාවේදී ග්‍රහයන්ගේ පිහිටීම මගින් අපේ අභ්‍යන්තර නාම සහ රූප සමග එතරම් සම්බන්ධ නොවූ අපේ ශරීරයෙන් පිටත ඇති නාම සහ රූප වලට සම්බන්ධ වීම ආරම්භ වීම ග්‍රහයන්ගේ පිහිටීමේ සහ ශක්තීන්ගේ බලපෑම් වලට අනුව පාලනයක් වීම ආරම්භ වෙනවා වෙන්නත් පුළුවන්. +Empty - Empty + Distance - Distance = Both Appearing and Disappearing + Appearing + Disappearing = Everything in the Universe came out and coming out from the Emptiness (0) and the Infinity (∞) of the Universe. Buddhist Explanation About Form/Matter/Rupa/Nospace (-empty) and Space (+empty): "Form is emptiness, Emptiness is form."